Between January and March, most of Western Kenya experiences a climatic dry period, when grass and other plants stop growing, forcing farmers to buy fodder from outside their area to feed their cows or face huge reductions in milk production. This year, the area has suffered from a pro-longed drought, with no rains since mid-November, where animals and crops alike have suffered as farmers struggle to find fodder and water for their animals let alone their crops. 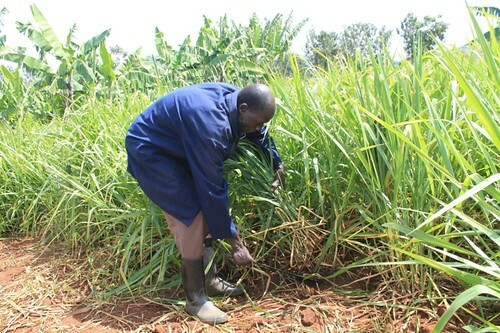 In Kapuoyo village, Homa Bay County, farmers have hope as they learn from their Village-based Dairy Advisor (VBDA), Mr. Stephen Nyamisi as he harvests a new fodder-grass called Brachiaria from his quarter-acre plot to feed his cow. Brachiaria is a high quality fodder grass that is tolerant to drought, recovers fast after harvest and is tasty to the animals. The grass also has a high protein content compared to Napier (the conventional fodder grasses) and so results in higher milk-production by cows. In previous years, Stephen would spend up to USD 0.5 per day for totaling USD 45 over 3 months. Buying fodder from the highlands of neighboring Kisii County which remains wet longer than his home area in Homa Bay County. This year, despite the drought, Stephen is not worried and he has not had to spend any money on buying fodder for his cow; he has more than enough feed after planting ¼ acre plot of Brachiaria and another ¼ acre of improved varieties of Napier grass using new methods for soil and water conservation. The farmers in Stephen’s village will gain from his hard work as a VBDA. Over the last year, Stephen has promoted improved fodder to more than 60 farmers in his village, giving them planting materials for Brachiara and Napier and offering extension advice on how to plant them. He plans to extend to a total of 100 farmers over the coming season (between April and June 2017). Farm Input Promotions Africa (FIPS-Africa) under the dairy component of Feed the Future’s Kenya Accelerated Value Chain Development Program (AVCD) has recruited and trained 147 self-employed VBDAs like Stephen in five counties of Busia, Homabay, Siaya, Kisumu and Vihiga. As a key component of their work, VBDAs are multiplying planting material for improved fodder crops such Brachiaria, disease-tolerant Napier varieties desmodium and caliandra. VBDAs then share the planting materials with farmers in their villages. “Brachiaria has survived where our local fodder did not over this dry season (November 2016 –March 2017). This has encouraged farmers confident on the new grass’s suitability for this region, they are all creating space to plant when the rains come back,” he says. During a similar drought in 2011, Stephen says he had to stop milking his cow for two months because the cow was not feeding well and could not produce enough milk for its calf and the family. The 2011 drought affected Stephen’s household income and nutrition. Without any milk to sell for two months he lost approximately 300 liters that was worth USD 150 (at a price of USD 0.50 per liter). The family normally drinks milky tea every day, but milk-less tea became the norm in his house since he could not afford processed milk. “I could only buy milk once a week from Oyugis market at USD 0.65 per liter, and this was for cooking indigenous vegetable – not drinking,” he says. By using Brachiaria, Stephen’s cow has not only maintained her milk production through the current drought but has actually increased! Since October 2016, milk has increased from 5 liters a day (with the previous calving) to 8 liters a day (new calving). “I used to get 2 liters in the morning and 3 liters in the evening before I introduced Brachiaria in my cow’s diet. Today I get 5 liters in the morning and 3 liters in the evening! Just by blending Brachiaria in my cow’s fodder, I am so happy.” Stephen exclaimed. The 8 liters Stephen gets now will earn his family USD 720 over a period of 6 months. The additional 3 liters per day, has increased the household income from milk by USD 270. Over the last year, VBDAs in the Feed the Future Kenya AVCD program have helped more than 4,535 farmers plant Brachiaria and or Napier on their own land. They target to reach an additional 6,000 farmers in the coming season.